As banana bajji wrapped in a newspaper took the round of the motley gathering on the roof of a house in Besant Nagar, no one was too keen to have it. They had arrived at the venue at five o’clock as planned, after a tiring day at their jobs and colleges. However, their own hunger was not on their mind right now. They were more concerned about fisherfolk and local residents of a coastal village, more than 700 kilometers south of Chennai, many of whom have not gone to sea or earned any income since they started an agitation more than a month ago. 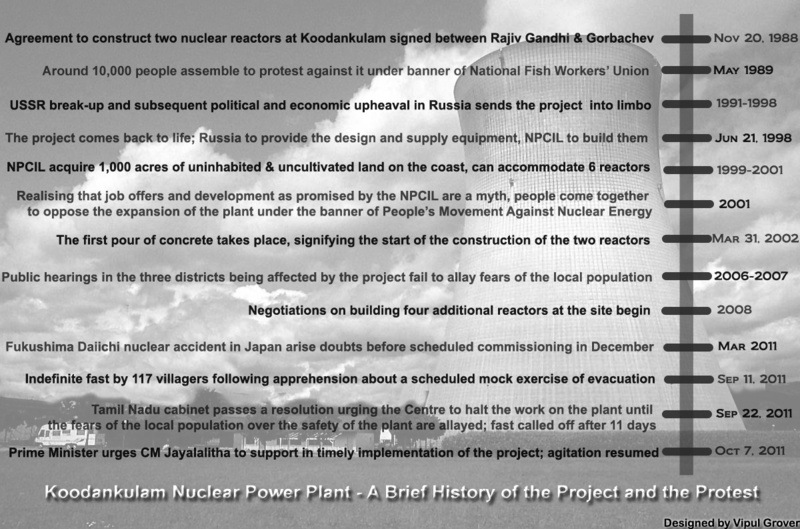 These villagers have been protesting against the commissioning of Koodankulam Nuclear Power Plant in Tirunelveli district of Tamil Nadu, which according to them not only poses danger to their livelihood by endangering the marine life but even holds larger nuclear safety issues. Though hardly a dozen and a half turned up at the meeting organised today evening at the collective’s office, it did not deter those present to carry on the proceedings with utmost conviction. Protests against this project have been going on since its very inception, more than two decades ago. The adjoining info-graphic traces its history. Click on it to enlarge. 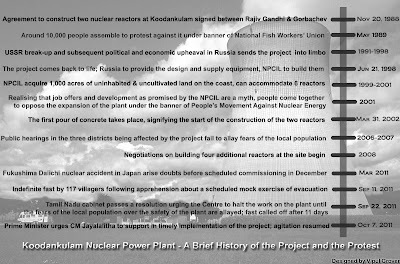 The present round of agitations started with 127 villagers going on an indefinite hunger strike on Sep 11 as the date of commissioning of the first two reactors neared. Their basic apprehensions rose from the plight of Japanese towns of Okuma and Futaba following the Fukushima-Daichii nuclear disaster in March earlier this year which led to release of radioactive material. Those present at the meeting concurred that Fukushima disaster being fresh in the minds of the people can also be used as a rallying point in their solidarity action. On the basis of extensive brainstorming, various ideas came up, were rebutted, were shelved or accepted. Nityanand cautioned that the solidarity action should be immediate but not sporadic. The group narrowed down to a petition campaign as their central medium. However, they argued for it to be more meaningful than just a signature campaign. It was decided that it will include fund-raising, in form of Rs 5 donations, to help the poor agitators, and will invite all those interested to further workshops and seminars on the issue. Besant Nagar was chosen as the venue for the petition campaign where the volunteers will create awareness over the weekend. A photo exhibition and a documentary screening were also planned at various venues which will exhibit the nuclear accidents at Chernobyl, Jaduguda and Fukushima to bring to light the dangers of nuclear reactors. There was also an appeal to push the envelope further. A suggestion was made in this direction to encourage the petitioners to adopt bio-composting at their homes. The argument was that by doing so, they can reduce their carbon footprint considerably which can act as an alternative to government’s assertion that nuclear energy is the only answer to global warming being caused by carbon-based fuels. Around half past six in the evening as it started getting darker, the collective members decided to disperse. The action will now shift to Besant Nagar beach which will see the tides of a new commitment, promising to be more than just a token gesture. How are you man? I thought of meeting you in chennai but I couldn't.. I am in London on an onsite assignment. Missing BAT.. I suppose it is time to host an edition what say? Do let me know if you wish to because I love too.. and regarding this report you have done it so so well man.. Love the way you write and I know better about TamilNadu Government.. Hmm.. Best of luck..
Hii... Really GrateTopic Only God Know..